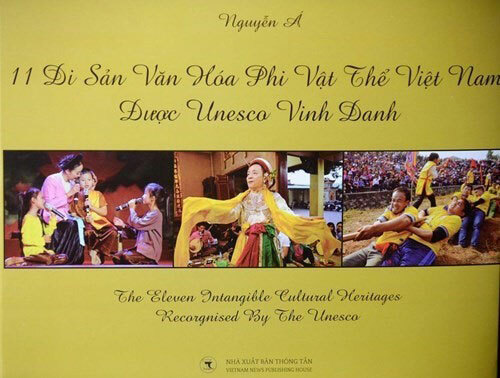 Vietnamese photographer Nguyen A published on December 30 a photo book featuring 11 UNESCO-recognised Vietnamese cultural heritage practices. The book was published by the Vietnam News Agency publishing house. The intangible cultural heritages presented in the book include: the Belief in the Mother Goddesses of Three Realms (a traditional practice with a long history in Vietnam); tug-of-war folk game; Vi and Giam folk song of Nghe Tinh; Don ca tai tu – a traditional musical art form of the south; the worship of Hung kings; Xoan singing in Phú Thọ; Giong festival at Phu Dong and Soc temples; Quan ho folk singing; Ca Tru ceremonial singing; the cultural space of gong in the Central Highlands, and Hue royal court music. Each intangible heritage is featured in the work’s 30 pages and illustrated by beautiful texts and photos. Nguyen A travelled across the country in 2016 to capture these heritages and meet with heritage artisans./.